ilbur Wright arrived at Bill Tate's front door in Kitty Hawk, North Carolina on 13 September 1900. He was road-weary, frustrated, and half-starved. It had not been a good trip. Will and Orv had spent the summer building the glider whenever they could spare some free time. They decided to frame the aircraft in spruce and ash, make the fittings from low-grade steel, and brace the assembly with 15-guage bicycle spoke wire. Some of the parts they made, some they had made, and still others they adapted from off-the-shelf products. The U-shaped parts that formed the wing tips, for example, were actually bent wooden "extension top bows" meant to support the folding canvas top of a small carriage. The Wrights bought them from a local wood fabrication company that supplied parts to carriage makers. Wilbur, who could "sew a shirt or a dress as good as any woman" according to his friends, made the wing coverings from "French Sateen" fabric. Some of the parts they decided to make when they got to Kitty Hawk. In particular, they left the spars -- the long, horizontal parts of the wings – until last. Wilbur had decided to make 20-foot (6-meter) long wings. The top bows would each take up 12 inches (30.5 centimeters) of that length, meaning he needed 18-foot (5.5-meter) long spruce boards from which to cut the spars. He could not find spruce this long in Dayton. He wrote Chanute to ask about the availability in Chicago and Chanute sent him several suggestions, but Wilbur did not act on any of them. He apparently decided he would buy the lumber on his way to Kitty Hawk. He knew his trip would take him through Norfolk with its many shipyards. Certainly a city where ships are built would have long lengths of lumber. Wilbur left Dayton on 6 September 1900, catching the Big Four railroad line to Cincinnati. He took with him the parts of the glider (minus the spars), tools, clothes, and a jar of preserves that his sister Katharine had packed. Orville remained in Dayton for a few weeks longer, orienting a man they had hired to tend the bicycle business in their absence. 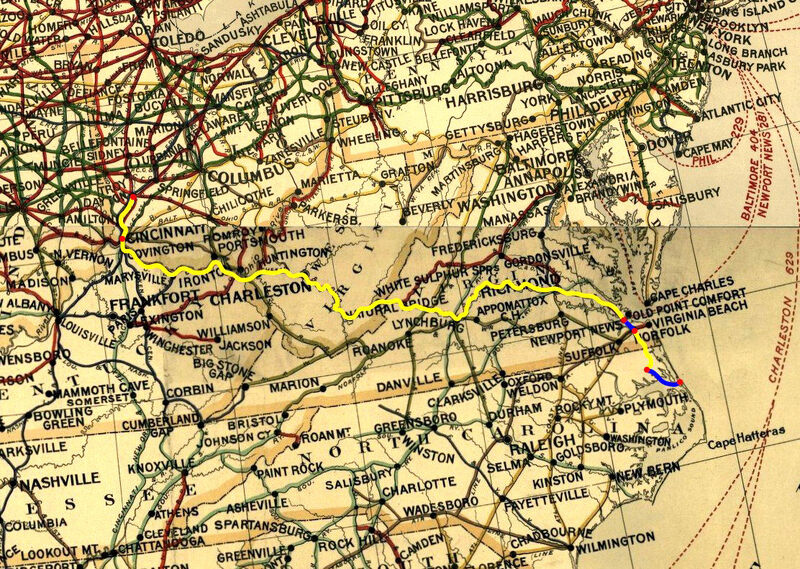 At Cincinnati, Wilbur switched to the Chesapeake & Ohio line, riding it to Old Point Comfort, Virginia. He caught the steamer Pennsylvania across Hampton Roads (the mouth of the James River) to Norfolk, Virginia, where he searched for suitable lumber to make the spars. Apparently the shipbuilding industry, or any other industry in town, had no need for spruce in long lengths. In fact, Wilbur couldn't find 18-foot lengths in any sort of light-weight wood and had to settle for 16-feet (4.9 meter) pine boards. He then hopped on the Norfolk & Southern railroad line and arrived in Elizabeth City, North Carolina on Saturday afternoon, September 8. It was a much longer stopover than he intended – he couldn't find anyone at the waterfront who had even heard of Kitty Hawk, much less someone who could ferry him and his equipment over the Albemarle Sound, the body of water that separated Elizabeth City from the Outerbanks. It wasn't until Tuesday, September 11, that he ran across Israel Perry, skipper of the dilapidated schooner Curlicue, who could take him on his final leg of the journey. To read Wilbur's account, the voyage of the Curlicue was only a little less arduous than the Odyssey of brave Ulysses. Wilbur, Perry, and Perry's young mate left Elizabeth City late in the afternoon, sailing down the Pasquotank River. It was dark before they reached the Sound, and the wind and waves began to build. Late that night with a gale blowing, the foresail tore loose, followed by the mainsail. 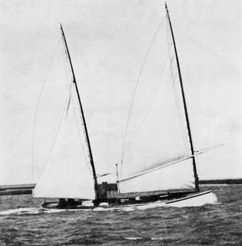 Wilbur and Perry's mate worked to retrieve the flapping canvas while Perry made for shelter in an inlet, running with nothing but a jib. The next day was spent repairing the sails. 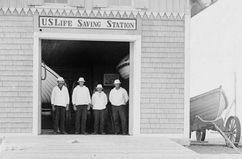 The Curlicue finally limped into Kitty Hawk Bay late at night on September 12 and Wilbur reluctantly spent another night aboard. The next morning, a young boy led him to the Tate's house. He had eaten nothing for two days but the small jar of preserves. Upon meeting Wilbur face to face, Bill Tate decided the first order of business was to feed him. His wife Addie started a fire and cooked ham and eggs. Later Tate remembered that Wilbur "done a he-man's part by that humble breakfast. I didn't asked him if he enjoyed it; the question would have been superfluous." After the meal, Wilbur asked if he could board with the Tates. This presented Bill and Addie with a quandary. They were not set up for lodgers and they retired to the adjacent room to discuss the request.. 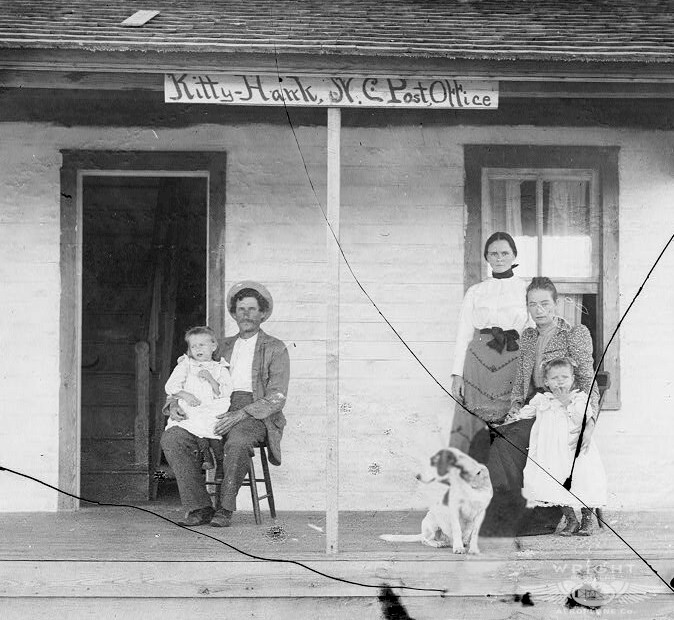 There were four Tates – Bill, Addie, and two young daughters, Irene and Pauline – and the house only had two bedrooms. Additionally, Addie was worried that what little they had to offer in the way of room and board was much too poor for the citified Mr. Wright. Will overhead the conversation and came to the door. "I should not expect you to revolutionize your domestic system to suit me," he said stiffly, trying to reassure Addie. "But I should be considerate enough to subordinate myself to your system so as not to entail any extra hardship on you." There was an awkward pause while Bill and Addie tried to decide how they should respond to this confusing string of fifty-cent words. Finally, Will translated, "I will live as you live." The Tates agreed and Will moved in. It was the beginning of a warm friendship between the Wrights and the Tates that would last for decades. 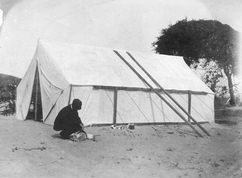 The next day, Wilbur set up a canvas awning in the Tate's front yard and began to assemble the glider. He borrowed Addie's sewing machine to modify the wing coverings for the shorter spars, impressing her with his sewing skills. The glider was almost complete on September 28 when Orville showed up with camping gear and other items that Wilbur had written him weren't available on the island. (To study the 1900 glider in detail, visit our Virtual Hangar.) Both brothers stayed with the Tates until October 4 and then pitched their tent about a half mile (800 meters) south, tying it to a scrub oak to keep it from blowing away. About the same time, they began to test-fly the glider. Wilbur's plan had been to tether the glider in a strong wind like a kite, climb aboard, and practice controlling the aircraft while hovering over the same spot. Lilienthal, he knew, had made over 2000 glides in 5 years and had only accumulated only about 5 hours in the air – hardly long enough to develop proficient piloting skills. Wilbur hoped to rack up that much flight time in one or two afternoons. But his plan collapsed on the first try. As Orville and Bill Tate slowly played out the tether lines in a strong wind, Wilbur and his glider began to weave and bob, out of control. He began to wave earnestly, screaming "Let me down!" Bill and Orv could not hear him above the wind. They took Will's aerial acrobatics to be the result of his deft manipulation of the controls, and thought his waving was encouragement to let out more rope. Will climbed higher and higher until his gesturing became so frantic that his two assistants realized something was wrong. They quickly reeled him in. When the story was told at the Wrights' home in Dayton, the anguished cry "Let me down!" became a go-to jibe that always drew a smile. Most of the subsequent tests involved flying the glider as an unmanned kite. The Wrights, with Tate helping every second he could spare, learned to how to yoke the aircraft to the tether lines and manipulate the controls from the ground with cords. They flew it with lengths of chain wrapped around the "belly bar" between the lower wings and measured how much weight the glider would lift in a given wind. They even kited Tom Tate, Bill's nephew, aloft while they controlled the glider from the ground. Throughout these tests, the glider took a beating but proved remarkably resilient. When something would snap, "we hastily splint the breaks and go ahead," explained Orville. 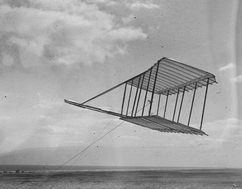 On October 10, the brothers were making adjustments with the glider resting on the ground when the wind snatched it "without a sixteenth second's notice," according to Orville, carried it about 20 feet (6 meters) and dashed it to the ground. It was badly damaged, but after three days repair the test flights resumed. During these tests they broke important new scientific ground, although they weren't yet aware of its impact. Using a spring scale and an inclinometer, they measured the lift and drag generated by the glider while it was flying. They were the first investigators ever to measure the performance of an aircraft in flight. In doing so, they bridged an important gap between aerodynamic theory and its application. The numbers that Lilienthal and others had generated with wind tunnels and whirling arms should match measurements in the field, or so the Wrights believed. Theory had to predict performance, otherwise what good was it? And the Wrights found that their measurements didn't agree with the predictions of Lilienthal's tables. Their glider produced much less lift than Lilienthal's numbers said it should, even taking its shortened wings into account. This perplexed them. Was it due to their inexperience? Did they miss something? Or was Lilienthal wrong? Their experiences with the tail were just as confounding. Orville wrote to Katharine, "We tried it with the tail in front, behind, and every other way. When we got through, Will was so mixed up he couldn't even theorize. It has been with considerable effort that I have succeeded in keeping him in the flying business at all." They decided to discard the tail. Sometime in late October with a stiff wind blowing, Wilbur, Orville, and Bill Tate took the glider to Kill Devil Hills for the first time. The Wrights immediately recognized the environment was better suited for gliding than anywhere else on the island. The hills were high, but the slopes long and gentle. The sand looked as if it had been scrubbed clean of vegetation -- which, in fact, it had. The year before, in 1899, there had been a massive storm known as the San Ciriaco Hurricane, the deadliest and longest-lived hurricane ever recorded up to that time. It had literally scoured the island and piled up tons of new sand. The Wrights made about a dozen manned glides. They had tied off the kickbar, having found that manipulating both the elevator and the wing-warping at the same time was more than an inexperienced pilot could handle. Comments the brothers made much later indicate that they flew not only in the prone position but also hanging beneath the glider as Lilienthal had done. They preferred to fly prone. According to Will's calculations, a prone pilot generated only one sixth the drag of a pilot hanging vertically. Wilbur did all the flying. He still considered these experiments to be primarily his personal undertaking. Even though Orville was shouldering an increasing share of the burden, Will didn't want to risk his younger brother's neck. The glides he made were unspectacular, but they were nearly as good as anything Herring had accomplished with the Chanute-Herring glider. More importantly, they gave Will a taste of flight without the terror he had experienced on his earlier attempt. In reading the correspondence concerning their 1900 trip to Kitty Hawk, what strikes you most is how little flying the Wrights did. 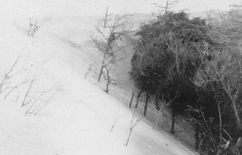 There are only scant records of their experiments; of the dozens of photos they took only three that show the glider. Others show people, sand, birds, crabs, boats, and ocean much like any collection of vacation photos. You get the feeling that the Wrights weren't all that focused on the flying problem at this juncture. This was a gentlemen's adventure, they were strangers in a strange land, and everything about this unique experience demanded their attention. The Wrights left Kitty Hawk on October 23, and a good thing for Bill Tate. Another "banker," Doc Cogswell, had told Orville that Tate "...will be dead before Christmas from excitement if we don't get out." Before Will and Orv left, they took their glider out to the sand hills for one last ceremonial flight. They tossed the aircraft without tethers or pilot into the wind and watched as it soared out from the crest, then turned back and "whack(ed) the side of the hill with terrific force." After they had departed, Addie Tate went out to the glider with a pair of scissors and carefully removed the sateen fabric from the frame. She used it to make dresses for her daughters. 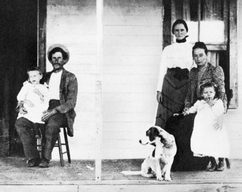 The Tate family – Bill is seated to the left with his youngest daughter Pauline. Addie is seated right with daughter Irene. Addie was Kitty Hawk's postmistress, having taken over Bill's old job. The woman behind Addie is possibly Bill's sister. 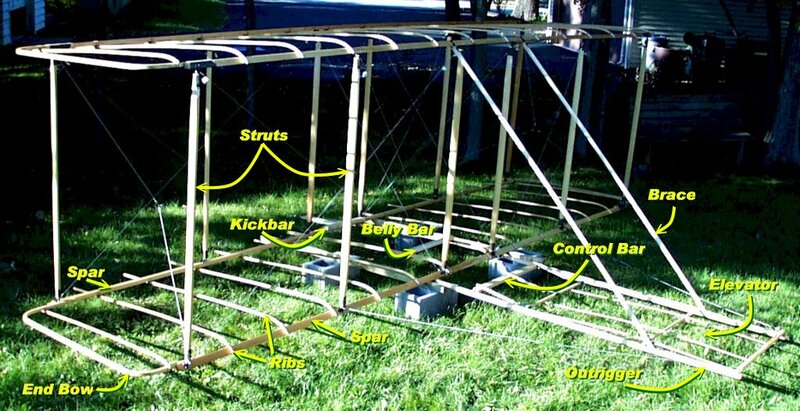 The frame of the 1900 Wright Glider with callouts identifying the major parts. An 1898 railroad map showing Wilbur's "Odyssey" across the country. Yellow indicates the portion of the journey covered by rail; blue indicates that traveled by ship. 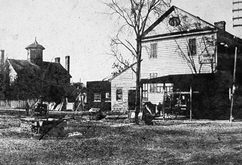 Downtown Elizabeth City, North Carolina about 1900. The two-story structure across the street was the hotel where Will stayed. A diorama of the Elizabeth City waterfront at the turn of the twentieth century. Will's description of Perry's ship indicates it was probably a "sharpie," a two-masted schooner designed specifically to sail the coastal waters of North Carolina. 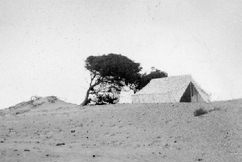 The Wright's camp just south of Kitty Hawk. Wilbur washes a frying pan in the sand. The two long poles leaning against the tent were probably spars for the 1900 glider. Our replica of the 1900 Wright Glider on the sands at Jockey's Ridge State Park, North Carolina. To see more details, visit the 1900 Glider in our Virtual Hangar. The 1900 Wright Glider flown as a kite to test lift and drag. 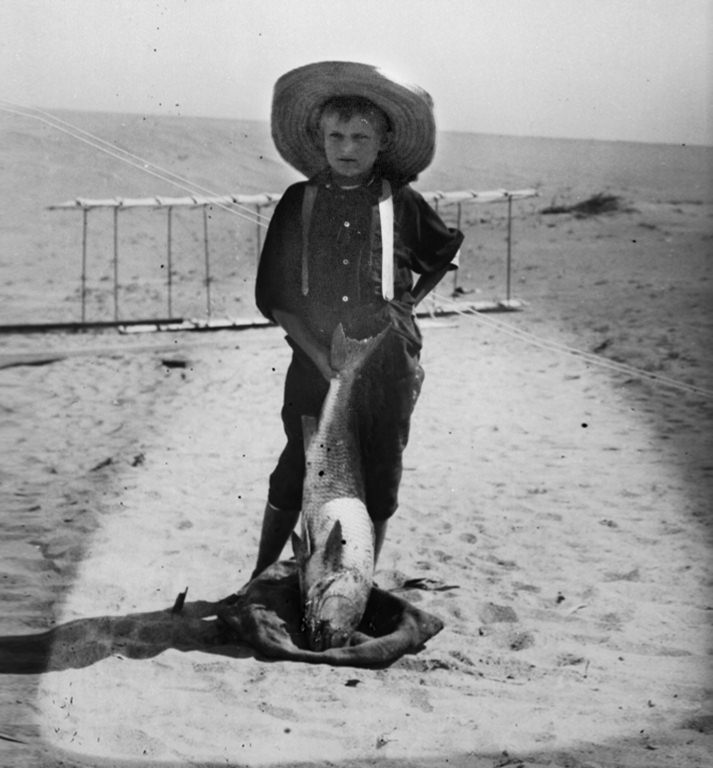 Tom Tate, Bill's nephew, with a fish almost as big as himself. Note the glider behind him. 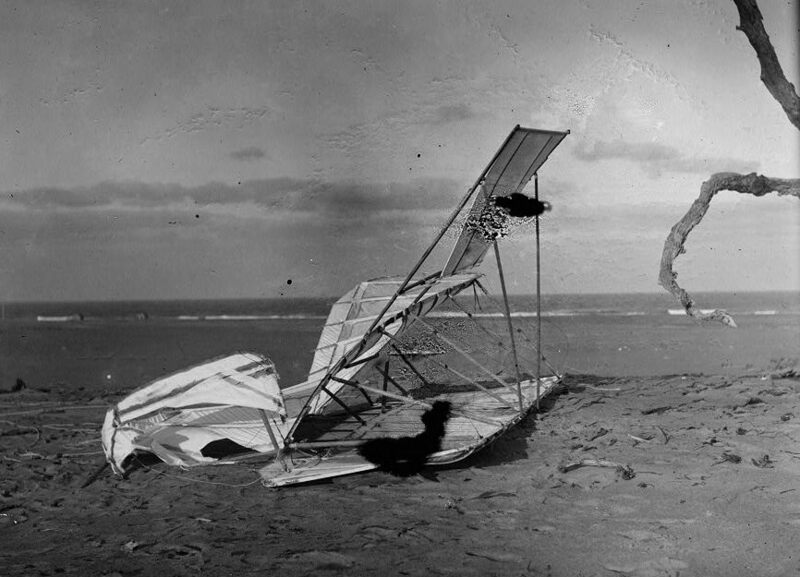 The 1900 glider after being wrecked by a gust of wind. 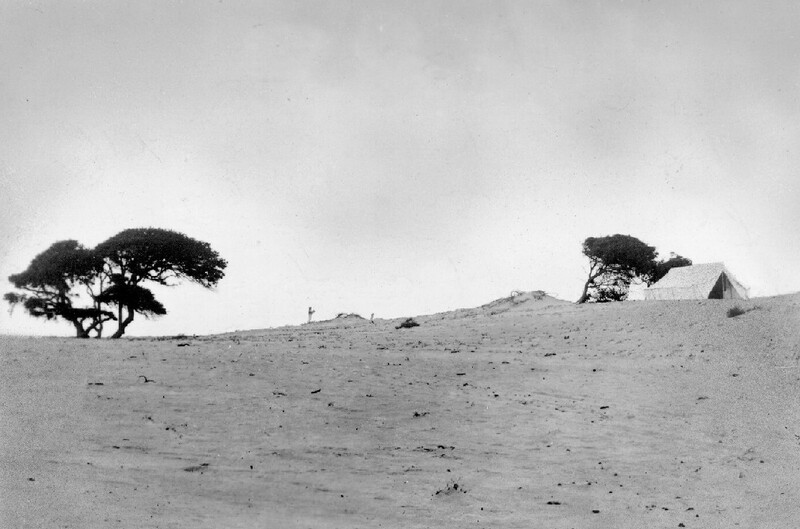 This photo, taken by the Wrights in 1900, hints at the destruction wrought by the 1899 hurricane. Parts of this forest were buried to the tops of the trees. 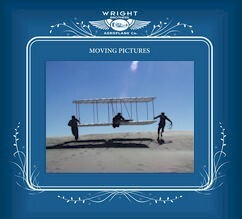 If you like to see some flight tests of our 1900 Wright Glider replica, click HERE. 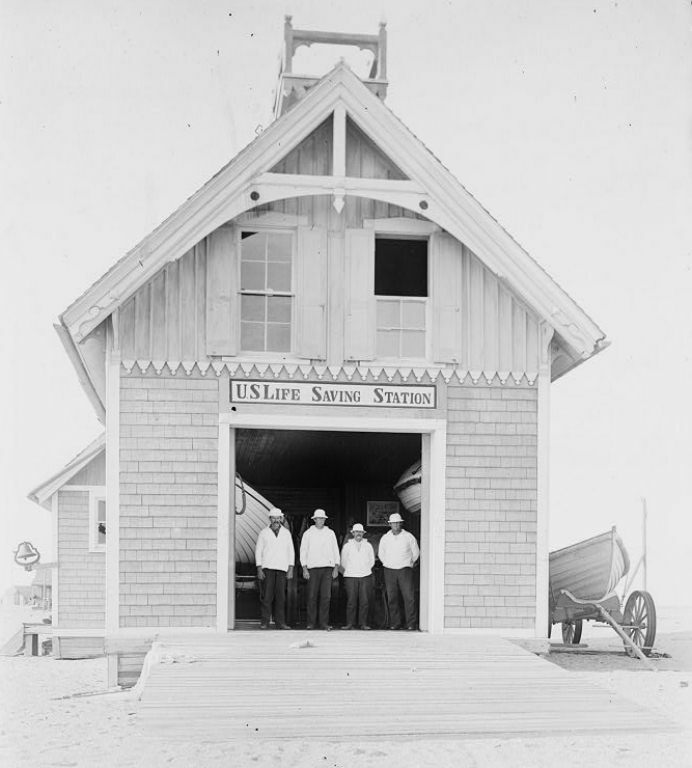 One of the Wrights' many "vacation" photos – the Kitty Hawk Life Saving Station and crew. The Voyage of the Curlicue Wilbur tells the harrowing story of his passage with Captain Israel Perry aboard his leaky vessel. Summing Up Wilbur gives a concise report on his first aeronautical expedition to Octave Chanute. The Wright Triangle How Wilbur and Orville became the first to measure the performance of an aircraft in flight. 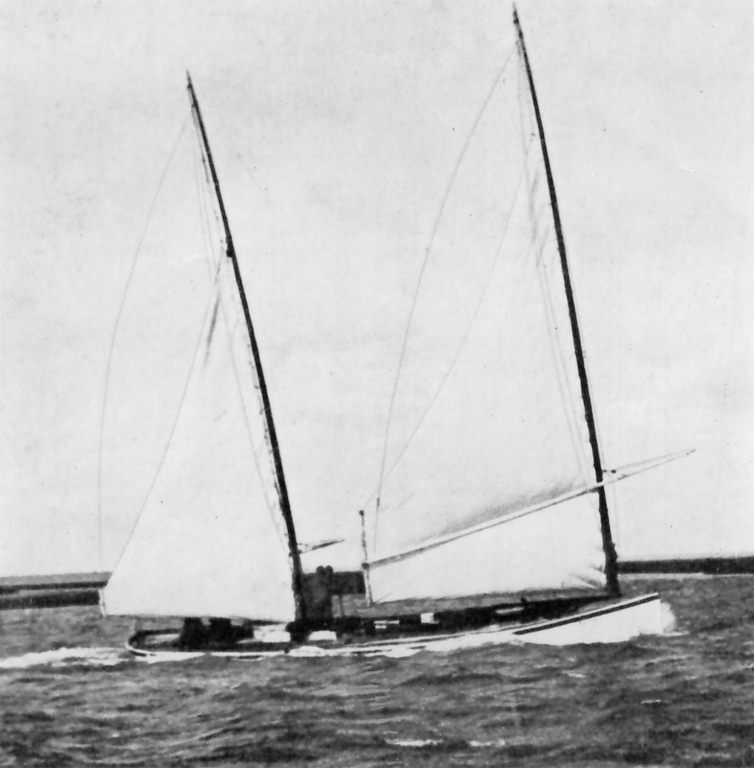 A North Carolina sharpie running in a gale.